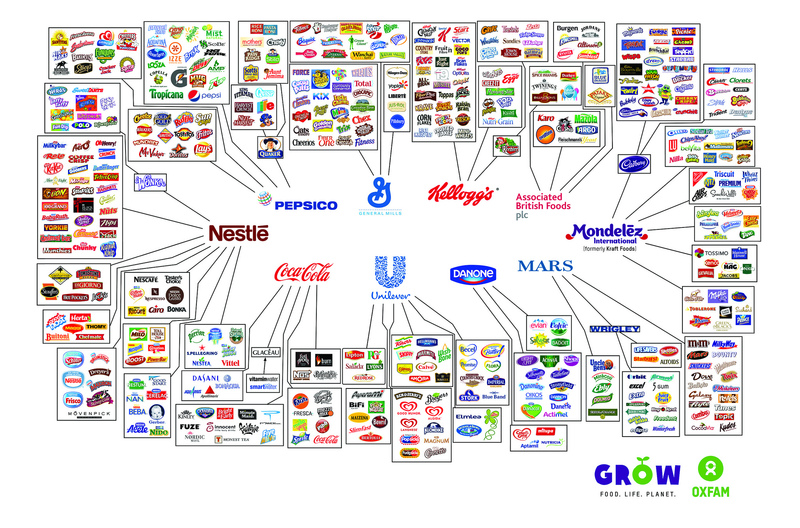 These 10 companies make a lot of the food we buy. Here’s how we made them better. After customers like you spoke up, General Mills, Coca-Cola, Nestlé, and other giant food companies made new commitments to help people and the planet. So why should these huge companies care about doing business responsibly? First, because their global operations touch countless lives. “These corporations are so powerful that their policies can have a major impact on the diets and working conditions of people worldwide, as well as on the environment,” wrote Alexander E.M. Hess in USA Today. Second, because shoppers these days think about factors like fairness and sustainability—and we’re increasingly (and successfully) demanding that the brands we buy do the same. 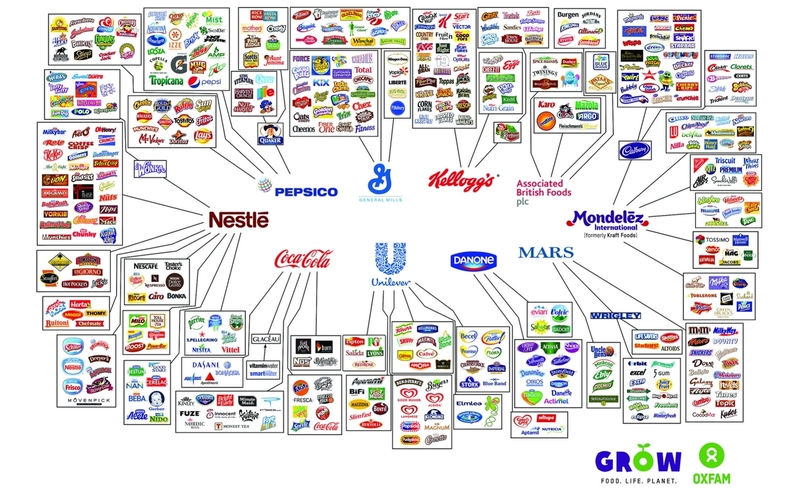 These food companies may be big, but no company is too big to listen to its customers. Enter Behind the Brands. 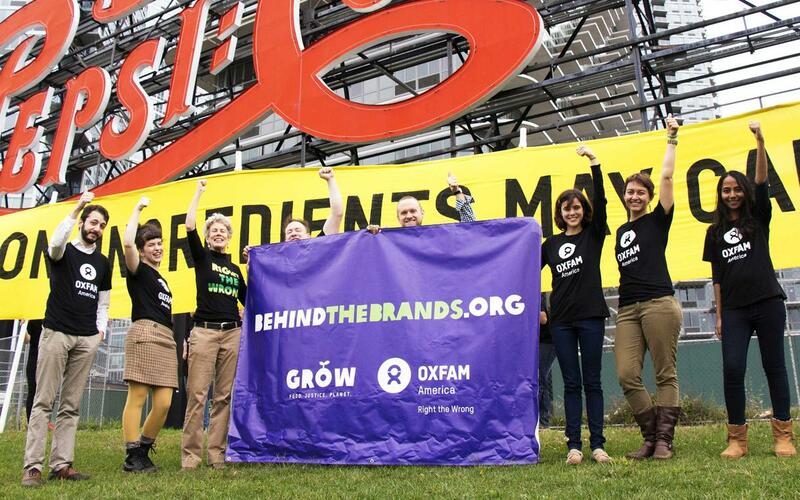 Launched last year, Oxfam’s campaign takes a closer look at the “big 10” food companies’ policies, encourages them to do more for people and the planet, and, when needed, harnesses the power of consumer action to convince them to do better. Here’s a closer look at three of those issues and some big changes powered by people like you. The problem: Climate change could increase global hunger and make staple crops like wheat and corn more expensive. So it’s ironic that some food companies are actually contributing to the problem. An Oxfam report found that the “big 10” companies emit so much greenhouse gas through their supply chains that, if they were a single country, they would be the 25th most polluting in the world. Some also do business with companies that worsen climate change by burning down forests to clear land and by overusing polluting fertilizers. How we helped: After more than 238,000 people signed petitions and took action on social media, two of the world’s biggest food companies announced major commitments to address climate change and help fight hunger. In July 2014, General Mills—once ranked last by Oxfam among the “big 10” for its climate change policies—committed to setting targets to cut harmful greenhouse gas emissions. Then, Kellogg followed suit in August. Since then, “we’re seeing momentum in all sorts of places,” noted Oxfam’s Heather Coleman in a September 22 blog post. The industry as a whole is paying more attention, with companies like Mars and Unilever showing leadership on addressing climate issues. The problem: Land grabs are a bitter secret in the sugar supply chains of some of the world’s biggest food and beverage companies. Too often, poor communities across the globe are being kicked off of their land, without consultation or compensation, to make way for huge sugar plantations that sell to the biggest brands in the world. When families lose their land, they often lose their homes and their main source of food and income. 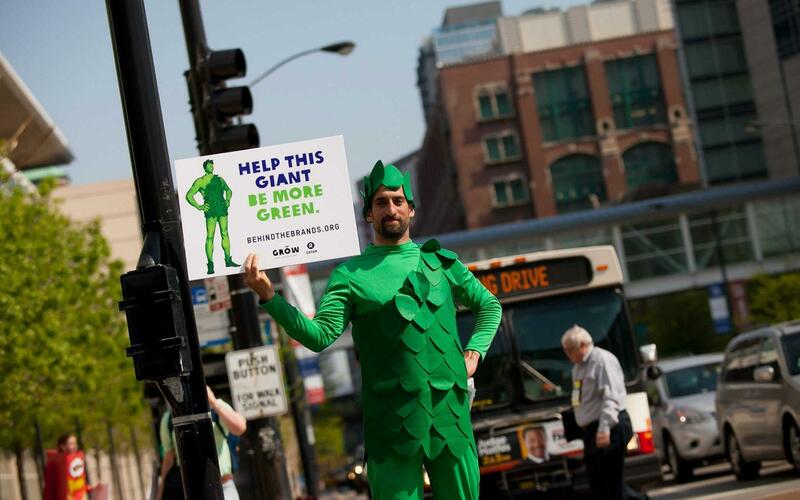 How we helped: More than 272,000 people joined the Behind the Brands campaign and called on PepsiCo and Coca-Cola to help stop land grabs. In November 2013, the world’s largest sugar purchaser, Coca-Cola, announced major commitments to respect and protect the land rights of rural and indigenous communities. PepsiCo declared similar commitments in March 2014. In August, Nestlé followed suit with a bold commitment to “zero tolerance” for land grabs in its supply chains. While these are important victories, “proper enforcement by the manufacturers will be critical to making sure the change is real, especially as sugar production increases,” wrote Mashable’s Venessa Wong. The problem: Ninety percent of the world’s cocoa is grown by small-scale farmers. But last year Oxfam’s research found that most cocoa farmers and workers live below the poverty line, earning less than $2 a day. Women cocoa farmers especially face economic hardships: Cocoa farmers in Nigeria told Oxfam that women are paid $2 to $3 for a day’s work, while men earn about $7 a day. How we helped: In 2013, hundreds of thousands of people sent messages via social media and email asking companies to improve their policies and help women cocoa growers get a fair deal. Three of the world’s biggest chocolate companies listened. Mars, Nestlé, and Mondelez—which together source nearly 30 percent of the world’s cocoa—all agreed to do more to ensure fair treatment of women workers and growers in their cocoa supply chains. So how have companies done since then? An evaluation released in October 2014 found that, while they have kept some of their commitments, all three can and should be doing more to fulfill their promises to women cocoa farmers and workers. Oxfam will be keeping a close eye on their progress in the year ahead. And if companies don’t follow through, we’ll call on people like you to hold them accountable.